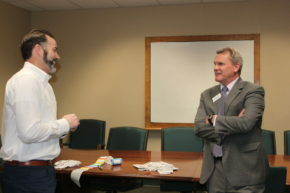 We stopped by the Fairview Technology Center late Thursday afternoon for an open house that The Development Corporation of Knoxville was hosting. It’s the oldest business incubator in the region, housed in the former Fairview Elementary School in the Solway Community of West Knox County. “We wanted to provide extra exposure for the facility and our tenants,” Jonathan Patrick told us. He’s a well-known local entrepreneur and the creator of the SouthFound podcast series who is providing part-time administrative services at Fairview as well as consulting with the tenants. The center is home to nine local start-ups, many that have been spotlighted on teknovation.biz. For the most part, Fairview is at full occupancy. “It’s not just full, but full with good companies,” according to Todd Napier, President and Chief Executive Officer of The Development Corporation, explained. There is one company that is leaving, but its larger space will become the new location for an existing tenant. “We’re also talking to a company to take the last two spaces we have,” Napier added. 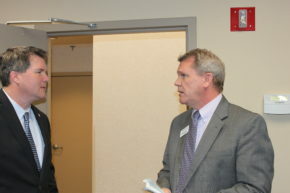 In the first photo, Patrick (left) and Napier talking as the event kicked-off. Just after we took that photo, Knox County Commissioner Larsen Jay dropped-in for a tour. As we toured the building with our trusty Canon camera, we chatted with a number of the entrepreneurs. 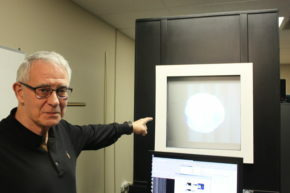 Here’s Tommy Thomas of 3rd Dimension Technologies who is pointing out a fascinating presentation of the globe (hard to see, I know). 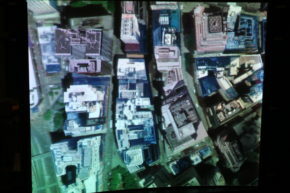 It’s probably easier to understand the technology if you could have seen the three-dimensional presentations built on Google Earth (second photo). 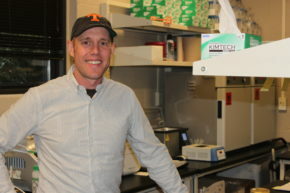 In the first photo, we captured Dan Close of 490 BioTech in the company’s lab in the former school cafeteria. 490 BioTech is providing high-quality bioluminescent cell lines. We also talked with Michael Zemel of NuSirt Biopharma, a start-up dedicated to better medicine by combining natural compounds with various pharmaceutical agents. 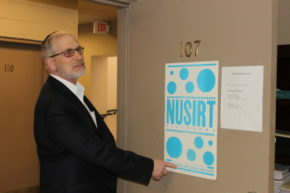 In this photo, he’s is pointing to a poster with NuSirt’s investors. Finally, one of the newer tenants is TCPoly Inc., a participant in cohort two of Oak Ridge National Laboratory’s “Innovation Crossroads” program. Here, Co-Founder Matt Smith (facing camera) explains one of its 3D-printers and its role in helping TCPoly develop a new class of high thermal conductivity composite materials to Sam Hart (left) and Alex (Kleto) Ciborowski of the Knoxville Chamber.